Identity.Next took place on 8 December. It was IMHO an interesting event, which succeeded in bringing togther the more tradional IAM with the more internet/social identity people. In the morning were presentations in three tracks, and the afternoon was an unconference session lead by Kaliya Hamlin (identitywoman), on subjects like business models for consumer identity (see also this interesting post), authorization in the cloud and privacy. It was the first edition, and Robert Garskamp (founder of Identity.Next and the driving force behind it) announced that it would not be the last. Thanks Robert for your hard work! 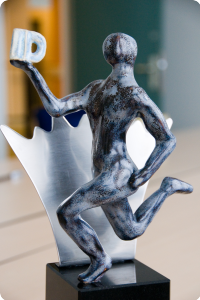 During Identity.Next the Novay Digital Identity award was issued. With this award Novay and Identity.Next was to support an innovation in the area of digital identity. Jury members were Yme Bosma (Hyves), Jaap Kuipers (PIMN & Diginotar), Dennis van Ham (KPMG) and Hermen van der Lugt (Novay). The jury selected three nominees from the submissions: the Dutch Banking association (with their new awareness campaign), the European STORK project (a pilot on federating the nationale eID solutions) and Ziggur (a new service to control your digital identities/profile after you’re dead). Hermen van der Lugt announced the winner: Ziggur!! Congratulation to them. See for example the pressrelease (in Dutch …) for more information. This entry was posted on Sunday, December 12th, 2010 at 12:46 and is filed under Uncategorized. You can follow any responses to this entry through the RSS 2.0 feed. You can leave a response, or trackback from your own site.